Proprioception is the sense sensing positions and movements of neighboring parts of the human body. It relies on the proprioceptors in human muscle skeleton system and skin. Etymologically, the world Proprioception is from Latin “proprius”, meaning “one’s own self” and “capio” meaning “to apprehend”. In the view of physiologists proprioception means that perception of the position of body’s parts, especially when the body is in movement. [Barlow, 2009] For animals, proprioception is the receptors in muscle and baroreceptors in the inner ear which control the balance of the body. As for Plants, instead of sensing position it has been replacement by gravity or light gradient. Even for unicellular organisms, they show the awareness of their own location and movement within the liquid, besides, monads have stretch receptors in their membranes, which allowed them to sense their own form. [Martinac;Kloda 2003] As the unicellular organisms got its own awareness of position and performance. The awareness is a human body may be the culmination of the consciousness of each cell in human body. New York Times, Artforum, Wall Street Journal, and Gothamist. Visual perception always assists proprioception. For the simple movement like grasping a book, with seeing the book at first, eyes sending the single to the brain to get the command to grasp it. In fact, it demands constant modification of proprioceptive sense. Otherwise, the smooth movement is unachievable. The researchers show that the continuously updated messages from proprioception is not based on a simple feedback mechanism. Because the singles from arms or legs are too slow to reach the brain and lead the movement. [Hoffmeyer, 2002] This doesn’t mean version or brain have no relationship with body movement. As mentioned before, version act as an important sensory assistant human’s proprioception. It functions proprioceptive as an integral component of the control system for maintaining the stance. [Lee, D., Lishman. J. 1975] The interaction between human proprioception and environment will being changed if the perspective of the version change. So the upgraded of visual ability will enhance the capability of sensing the location of our body in a dynamic way as well. By changing human perception and action, the interaction of the body with interior or exterior will be redefined. The suit childhood by Jun Nishida, Hikaru Takatori, Kosuke Sato consists of a visual translator and passive hand exoskeletons. The device provides the interactions between natural perception and surrounding. Using a pan-tilt stereo camera that follows wear’s head movement attached at the waist position can simulate a child’s version. The hand exoskeleton attached on a wearer’s hand can act as child-size hand and generate grasping motion. They assumed that by virtualizing and transforming the child’s body proprioception, the wear’s interactions with the actual surrounding environment would provide a particular perception and emotional experience in child view. It proved the real-time experience for adults to understand the child feeling and behaviours. It can used as a design tool to help the designer design the suitable product or space for children. 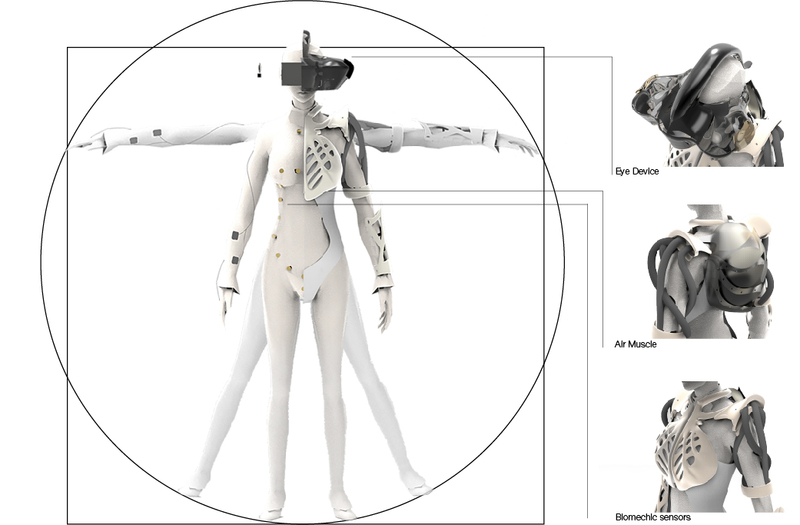 The polymelia suit is a wearable prothesis that include different biometric sensors, air muscle, electrical muscle stimulation pads, earphone and a helmet with augmented reality Oculus. It has been designing to upgrade the human body in the different perspective, considering the human body as an interface or platform to interact with. The biometric devices on the exoskeleton can take biometric data from the sensory body system, and give feedback actions through different actuators. Building the network between interior body and exterior environment. The exoskeleton of the arm can mimic other wear’s movement when they are connecting with other wearers.The eye device upgraded human version physically into 360°. When with the augment reality it also can see the connection between people when they have similar emotion state or even sharing the version with others. As for upgraded body proprioception, the way we sensing the external world with our body will change the visual perception has been enhanced into an artificial level which natural can never achieve. What’s more, with sharing and minoring behaviour are important in social communication, we assume that the device will enhance the interaction between people both psychology and sociology. The cooperating between varies sensor and actuators give the device amount of possibility to interact with different layers of body consciousness, the body itself may be possible to upgrade itself. Lee, D., & Lishman, J. (1975). Visual proprioceptive control of stance. Journal of Human Movement Studies.